Perfect for any gathering, this macaroni salad has all the great flavor of a jalapeño popper… jalapeños, cheddar cheese, bacon, and creamy dressing! 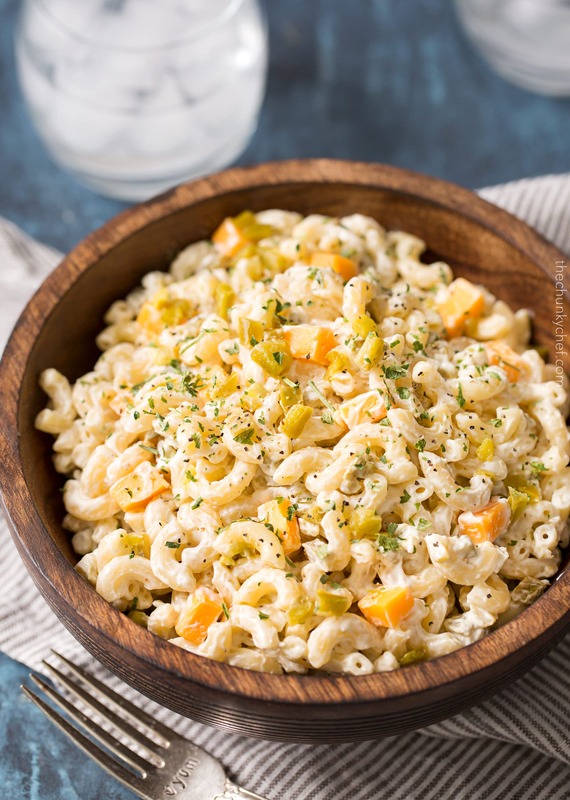 This is one macaroni salad that is FAR from boring… creamy and slightly spicy, like your favorite jalapeño popper appetizer! Bring this to your next barbecue, and prepare to have everyone asking for the recipe! You guys. I apologize for posting TWO cookout side dishes this week… usually I try to plan things out in my calendar to not do an entire week of very similar recipes… but this time, yep, it just didn’t happen. At least if the weather warms up soon (here’s hoping! ), you’ll be ready for the upcoming barbecues and get togethers! One of my favorite things to have at a cookout… okay sidebar here. What do you call them? Cookout? Barbecue? Get together? Backyard party? I never know what to call them here in posts! Around here, at least in my family, we call them cookouts, but I hate to always call them that and have someone be like “what is that?!“. Oh well, I’ll call them cookouts and you’ll just play along, okay? Alright… so, my favorite thing to have at a cookout is the macaroni salad. It’s base is pasta, like it’s cousin, the pasta salad (pssst, check out this Mediterranean version! ), but instead of an oil based dressing, it’s coated in a smooth, silky, creamy dressing. Usually that creamy dressing is on the sweet side (which I LOVE), but for this recipe, I wanted to veer away from the sweets, and head over into the spicy territory. Inspiration for this creation came when I was scrolling through my local grocery store’s website, looking at the deli options, and wishing they had more options for macaroni salad flavors. All of a sudden, I had a lightbulb moment and immediately jotted down this idea for a jalapeño popper version!! After some tweaking, I think this recipe is pretty great! It does have some heat, so if you hate spicy things, then unfortunately, this isn’t the macaroni salad for you. You can adjust the heat level by using jarred mild jalapeños (or even green chiles – I won’t tell! ), or go bold and use fresh jalapeños…. totally up to you! 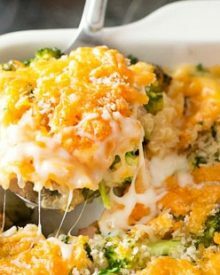 The dressing is cool and creamy, with no sweetness, just a little kick of garlic powder and some salt and pepper. It’s a three part dressing with mayo, sour cream, and a bit of cream cheese (for that classic jalapeño popper flavor). Like most cold salads, the longer it sits, the better it gets, so feel free to make this up a day ahead of time. Just save a bit of the dressing and toss it together before serving to freshen it up a bit. 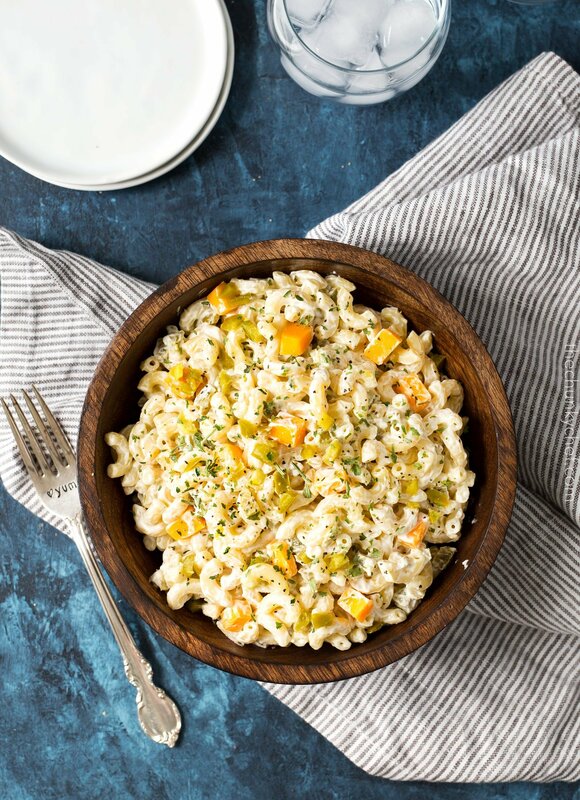 The next time you’re planning a cookout, don’t forget to add this unique Jalapeño Popper Macaroni Salad to your menu… you won’t be sorry! WANT TO TRY THIS JALAPENO POPPER MACARONI SALAD? PIN IT TO YOUR SIDE DISHES OR SUMMER BOARD TO SAVE FOR LATER! Perfect for any gathering, this macaroni salad has all the great flavor of a jalapeño popper... jalapeños, cheddar cheese, bacon, and creamy dressing! Bring large pot of water to a boil, add generous pinch of salt and boil pasta per package directions. Drain, and rinse pasta with cold water until cooled. 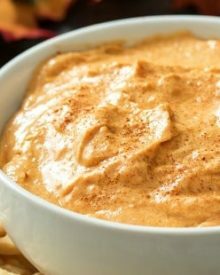 To a small mixing bowl, add mayo, sour cream, cream cheese, lemon juice, salt, garlic powder and black pepper and whisk until smooth and creamy. To a large mixing or serving bowl, add cooked and cooled pasta, jalapeños, cheese, and most of the bacon. Pour dressing over pasta and toss to combine. Sprinkle with remaining bacon, cover with plastic wrap and refrigerate for at least 30 minutes to allow flavors to fully combine. If desired, add a bit of melted butter to some panko breadcrumbs and cook in a dry skillet over LOW heat until fragrant and toasty. 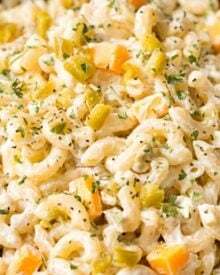 Before serving pasta salad, sprinkle the toasted breadcrumbs over the top. We don’t usually have pasta dishes but this looked really good. Finally made it yesterday and we loved it! I did add a little red pepper just for some additional crunch. I would recommend being careful with the peppers. I am not sure if mine were extra hot or oily but my fingers stung for hours afterwards. Next time, and there will be a next time, I’ll were gloves. I’ve never had this happen before with peppers but it was well worth it! The recipe looks delicious! Where did you get the fork? I love it. Can you use any pasta or does it have to be elbows? I only ask because I have 54 other varieties of pasta in my pantry, of course! Where is the recipe at? In a grey rectangle towards the bottom of the page… you had to scroll past it to leave a comment. Can this be made the night before and served for a cook out the next day? This is delicious! I’ve made it twice now and it is a hit with my hubby and son. Thank you! What an awesome twist to a staple summer dish! I can’t wait to try this! I am normally not a fan of pasta salads but I love the dressing and jalapeños so I definitely want to try it out! Love how you’ve updated the flavor of a traditional potluck favorite! 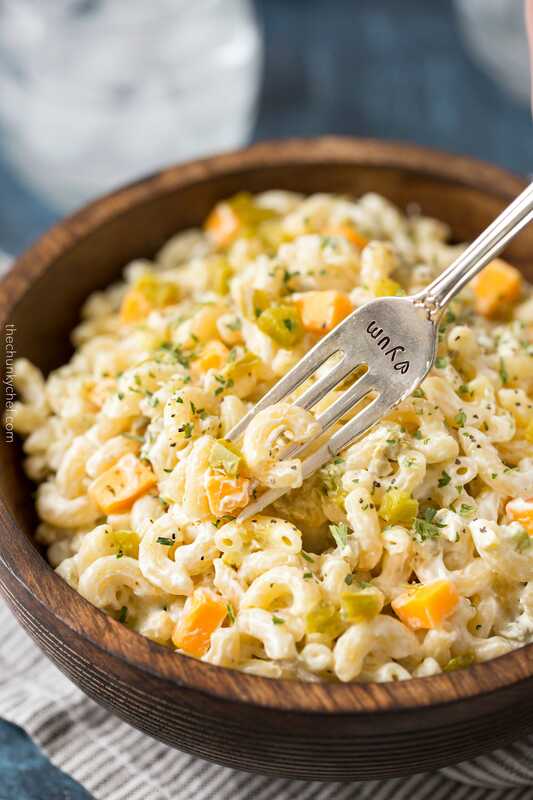 I love the kick of heat you added to this pasta salad! 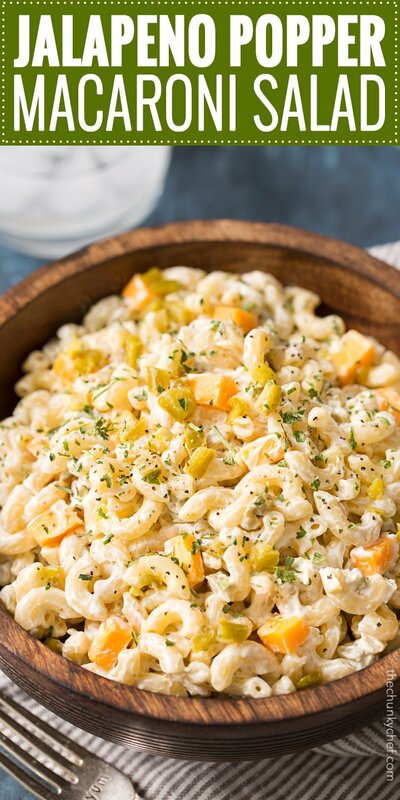 I love this creamy pasta salad! Looks so delicious! Just made this and it is delicious! I used hot jalapenos and a squirt of agave to just balance out the tartness, as I believe my lemon that I used was more than two tablespoons. My bad for not measuring! Very, very good. 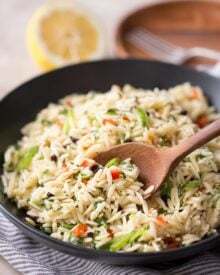 I loooooove spicy food and macaroni salad is one of my favorite side dishes! This is making my mouth water! You took a childhood classic that I l-o-v-e and added a delicious, spicy spin! LOVE this idea and cannot wait to make it this summertime. My husband would go bonkers for this macaroni salad. He’s the popper lover of the family. I’ll have to make this for him! This is exactly how I want my macaroni salad! Delicious!